A new survey of asteroids near Earth by a NASA spacetelescope has found a much wider variety of the space rocks than previouslythought, with some shiny and bright while others are dark and dull. The discovery suggests that near-Earthobjects are more diverse than scientists originally thought. The findingsare based on infrared observations of 100 such space rocks by NASA's SpitzerSpace Telescope. "These rocks are teaching us about the places they comefrom," said the study's lead author David Trilling of Northern ArizonaUniversity, Flagstaff. "It's like studying pebbles in a streambed to learnabout the mountains they tumbled down." The new findings are part of an even larger Spitzer telescopeproject to survey 700 near-Earth objects to catalogue their individual traits. Theresearch is detailed in the September issue of the Astronomical Journal. Spitzer's infrared observations are helping astronomers gathermore accurate estimates of asteroids' compositions and sizes than what ispossible with visible light alone. 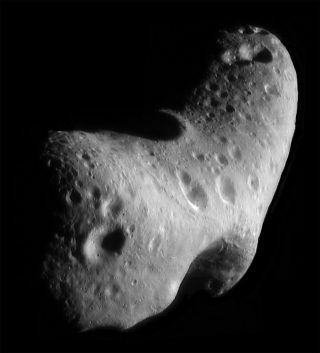 Visible-light observationsof an asteroid won't differentiate between a rock that is big and dark, orsmall and light. Both objects would reflect the same amount of visiblesunlight. Infrared data provide a read on the object's temperature,which then tells an astronomer more about the actual size and composition. Abig, dark rock has a higher temperature than a small, light one because itabsorbs more sunlight. Trilling and his team have analyzed preliminary data on 100 near-Earthasteroids so far. They plan to observe 600 more over the next year. Thereare roughly 7,000 known near-Earth objects out of a population expected tonumber in the tens to hundreds of thousands. "Very little is known about the physicalcharacteristics of the near-Earth population," Trilling said. "Ourdata will tell us more about the population, and how it changes from one objectto the next. This information could be used to help plan possible future spacemissions to study a near-Earth object." NASA's new space plan is aimed at sending astronauts to visitan asteroid by 2025, though there are relatively few viable targets forsuch a mission known today, agency officials have said. The Spitzer observations show that some of the smallerobjects have surprisingly high albedos. ( An albedo is the measurement of howmuch sunlight an object reflects. In addition, the fact that the asteroids observed so farhave a greater degree of diversity than expected indicates that they might havedifferent origins. Some might come from the main asteroid belt between Mars andJupiter, and others could come from farther out in the solar system. This diversity also suggests that the materials that wentinto making the asteroids ? the same materials that make up our planets ? wereprobably mixed together like a big solar-system soup very early in its history. In the future, both Spitzer and NASA's Wide-field InfraredSurvey Explorer, an all-sky infrared survey mission also up in space now, willtell us even more about the "flavors" of near-Earth objects. Thiscould reveal new clues about how the cosmic objects might have dotted our youngplanet with water and the organic ingredients needed to kick-start life. In May 2009, after nearly six years of operation, Spitzerused up the liquid coolant needed to chill its infrared detectors. The space observatory is now operating in a so-called"warm" mode (the actual temperature is still quite cold at 30 Kelvin,or minus 406 degrees Fahrenheit). But the space telescope is still conductinguseful science observations, NASA officials have said.